To an external observer, the obscene amount of time, money and effort spent by the massive congress propaganda machinery in propping up, praising and defending Rahul Gandhi was more than enough to turn your street corner paanwallah into Tom Cruise. Yet, the Shahzada, as lovingly called by Modi, appears as dry, as lame as ever. There is absolutely nothing in his personality that appeals to the common Indian. The only claim to fame Rahul has is increasing congress tally in 2009 elections in UP to 21, however with the benefit of hindsight it can very well be called a fluke. For the only thing consistent in his political career is failure. Bihar and UP assembly elections, where Rahul did extensive campaigning, Congress was routed. 4 out of 5 assembly seats in his own constituency Amethi was lost. We all remember how Rahul was shielded from going to Gujrat for campaigning. Congress was mauled by BJP in absence of Sonia Rahul who only joined at the fag end. His campaign style is as confusing as Manmohan Singh’s emotions. His speeches have more theatrics than substance. From his angry young man act of tearing manifestos on stages to rolling sleeves and adjusting mikes every two minutes. As for substance he presents, escape velocity of Jupiter and tales of his dadi mummy. How his papa gave mobiles to Indians. For an aspirational audience that wants better jobs, education and infrastructure his slogan was “poori roti khayenge, dawai khayenge aur 100 din kaam karenge”. 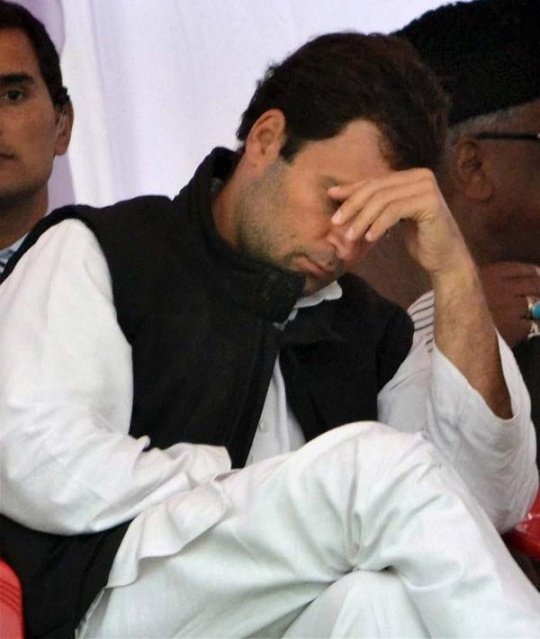 Rahul and his advisers still seem to be living in Indira Gandhi’s India of 1970′s. He has been projected as a PM candidate. As an MP he has never asked a question, his attendance in Lok Sabha is dismal. He has never spoken on matters of national importance. He seems way too much dependent on spin doctors, stage managed events and advisers to be an independent charismatic leader with a vision. If congress was hoping for a miracle to win 2014 elections, their hopes have been demolished by the results of recent assembly elections. India is increasingly assertive and aspirational. Free food, free medicines and 100 days job of digging ditches isn’t what India wants. Corruption, Inflation, crime, poor economy, poor infrastructure and a lot more are result of 10 years of congress rule and Rahul never took a lead in addressing them. The medicine named Rahul Gandhi prescribed by congress as remedy of India’s ills is long expired. A lot of people already know this. It’s just a question of who’ll bell the cat. The person who doesn’t have vision, he who don’t know what and when to say. He who doesn’t possess the quality of a leader, he who doesn’t know how much it takes to run a family, he who doesn’t know the impact of a failure in governance could cost how much . He is supposed to answer the query of common man is asking question to them , he himself shows disrespect to the PM of our country and his own fellow congress man by tearing and throwing the bills . Are you looking for him to govern this country ? Give your monthly salary to him and tell him to rule your house for a month , if he succeed Even I along with my friends will vote for him but if not I will request you to think differently. Think for your own problem which is in no way related to major Nuclear disarmament , global warming and the dynasty problem. Think for one time who doesn’t have earn a single penny at his own ,you want him to spend our hard earned money . The kind of governance Congress has have given will make sure that Rahul will never become PM of our country in his entire lifetime unless other political party running the government makes more and disastrous blunders what congress had done. So before pointing finger on others, do judge yourself as well . Dynasty is dying. This is the end of congress dynasty. You fool. Get some life. You trust the congress who killed 8000+ sikhs in 1984 as secular. Update your history knowledge. Read about all the communal riots happened in India post independence and under whose regime. You will get to know the truth. They want your vote bank. Congress is in power for most of the post independence period. Can you name one city/town/village in which a muslim community area is developed with all basic facilities? I’m from Hyderabad. I saw the entire Hyderabad change its look, but not the Old City area where most of them are muslims reside. Each time I pass by, I really feel heartfelt by the way the politicians treat them as sheer vote bank and nothing else. Prior to every election, some communal tension is imbibed in them intentionally by the leaders to make them forget about their demand for basic needs and development. This has been the trend so far. Congress believes in this and you fall prey. This shows how foolish/dumb you are. Did I mention anywhere that BJP is not communal. I only said not to trust congress. They want fools like you without heads on their throats to blindly vote for them. BTW… if you feel Ajmal Kasab/LeT belongs to RSS/BJP, yes 26/11 was done by them… lol. P.S: Please don’t bring shame to your fraternity by implicating Rahul Gandhi as your leader. With vengeance, the Congress-I Govt in the Center (with super-stars like Kapil Sibal, Chiddu, Salman Kurshid, Sharma, Shinde, Pawan Bansal, Anand Sharma, Abdulla, Moily, Oscar, Karge, Kamal Nath, Ashwani Kumar, Anthony, Patil, Beni Parasad, Manish Tiwari, Azad, Patel ..et al) is now going to go on a unprecedented overdrive and completely expose all the well-known fixers and deal makers in the AAP, in days to come! Congratulations dear Indians. Its the victory of good over evil. We wish you all “Congress Mukt Bharat” ahead. A shining Bharat, Prosperous Bharat, Happy Indians. Jai Hind Jai Bharat, Jai RSS, Jai BJP. You are most welcome to contribute articles and commentaries on relevant issues. 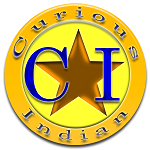 Please send your unpublished articles to admin@curiousindian.com Along with articles, please also send us a brief introduction of yourself. For guidelines, please visit Contact Us section.